This week was Opening Day for the Pittsburgh Pirates as well as the start of a new chapter for our little family. 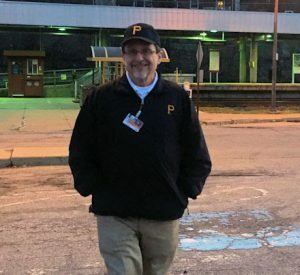 Tom put on his uniform for the first time on Monday and reported for his new job at PNC Park. His retirement didn’t last long! Though the opener didn’t end the way we would have liked, Tom was in his glory! Of course, on his first day on the job, the game went into extra innings, so it was a very long day at PNC Park. But Tom didn’t mind one bit! 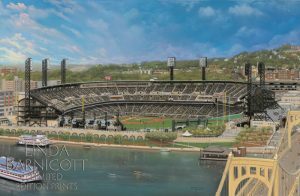 Thinking about him up in the Suite section talking to fans reminded me of when I painted, “Let’s Go Bucs at PNC Park.” When I painted Bill Mazeroski and The Great One, Roberto Clemente, I had a lot of help from the Pirates with gathering resources for the paintings. My dream, however, was to find the perfect view of the Park. Tom and I went location scouting and decided that the top of the Renaissance Hotel would provide the ideal vantage point. We walked right up to the desk and told them about our idea. Not only were they most generous and helpful, but they even gave us the key to the Penthouse Suite! It was a gorgeous room with an amazing view, and we took tons of photos. It was a picture-perfect day! The next Pirates game day found us parked in the Sixth Street Garage. We had a great spot overlooking the river and the Park, where I was able to take photos of the players on the field and some of the activity. Dave Arrigo, the team photographer, also very graciously provided photos of the first Opening Day at PNC Park showing lots of activity both in the Park and on the river. One of the parts of the painting that folks often ask about is how I painted the crowd. So how did I put all 38,362 people in the park as well as the players? In my studio, I have all different shapes and sizes of soft pastels. Some are very soft, and some are very hard, including pastel pencils. To create the crowd in the painting, I grabbed as many of those pencils as in as many different colors as I could hold in my right hand. Then I simply picked up a color and made a few marks for each person (a little heavy, naturally, on the black-and-gold clothing). 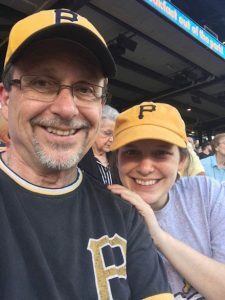 Tom has been a Pirates fan for as long as I’ve known him (and trust me, that’s a long time!). As it is for many other families, the home opener has always been a special time for Tom and our daughter Alyssa. So you might say that painting “Let’s Go Bucs at PNC Park” was a labor of love. And now that Tom’s living his lifelong dream of being a part of the Pirates organization, it’s even more significant to us.